You would have thought I won lottery when my daughter spotted the Daffodil Delight paper coming out of the SU! box, that arrived days ago. Her favorite color... yellow... her now "I want" is this "yellow".. EVERYTHING.. from the "Mom, can you find this color in a tee shirt for me?" to the "lets paint my friends frames in this color"... to at last "Mom, when you and John get married, I want to wear this color.."... GOOD LORD!.. who said the new Color Renovation was just going to bring excitement to us Stampin Gals? ... certainly they (SU!) are gaining approval from the teenagers.. thank heavens for small things I gues... now I may have to win the lottery to turn my darling daughters world into Daffodil Delight. 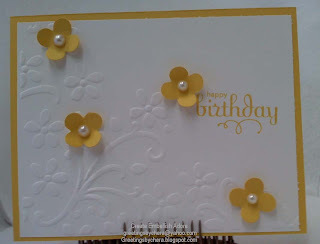 I used the Elegant Bouquet Embossing Folder, and then the Floral Fusion die for the flowers. "Happy Birthday" is from Perfect Punches. Wow! I love your card! It is just so-o-o elegant! Thanks for sharing! I agree I also love this card and CASED it today using a slightly different sentiment. Gorgeous!